Mister Rogers arrives with a book carrying case with several books inside. The books are written in various languages and Mister Rogers shares a portion of Où est Spot? -- the French version of Eric Hill's Where's Spot?. Recalling the recent visit to the Neighborhood car show, Mister Rogers shows a film of a time he drove an old-fashioned car. Waiting for delivery from Mr. McFeely, Mister Rogers sings Let's Think of Something To Do but is promptly interrupted by Mr. McFeely's arrival. Mister Rogers shares the delivery -- a film about children's television programs from around the world. In the Neighborhood of Make-Believe, Lady Aberlin is helping Queen Sara prepare for her temporary role as mayor as Mayor Maggie arrives ready for her new position as queen. Queen Sara and Mayor Maggie spend a moment discussing their respective duties with one another. Queen Sara is to meet with the Westwood town council while one of Mayor Maggie's duties will be to "listen out for Friday" -- a task Lady Aberlin agrees to help with. Meanwhile, at the Platypus mound, Nancy Caterpillar wants to become a butterfly but learns from Darrelle that there are many great thing about being a caterpillar. Together with Chuck Aber and Ana Platypus, Darrelle Butterfly sings I'm Glad I'm the Way I Am. At the castle, King Friday wonders if Mayor Maggie is ready for her duties as queen -- especially her responsibility to pay royal compliments when necessary. 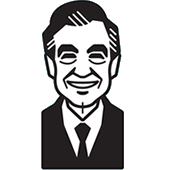 Back at the house, Mister Rogers talks about how men and women are different: "Men and women are different. They're different from the time they are born. But all of us are human beings -- boys, girls, men, women -- and we all have feelings about who we are and about who other people are." He concludes by singing Everybody's Fancy. Both the English and French versions of Where's Spot can be purchased from Amazon.com. The film of Mister Rogers driving an old-fashioned car also appears in Episode 1533.